The Wall cycle is our favorite market cycle at Long Wave Dynamics, except for the long wave of course. The Wall cycle forecaster is our favorite tool. The ideal Wall cycle is 141.944 days in length. The Kitchin cycle is a bit long for active investors seeking to invest capital and take profits. The Quarter Wall is a bit short and the target dates fall too close together for consistent decision making clarity. The Wall cycle is just right. The Wall cycle is a miniature long wave, i.e., a 56 year long wave divided by 144. The Wall cycle therefore often manifest the characteristics of the long wave in miniature pattern form. The Wall Cycle Forecaster tools are set with the default Wall cycle top and bottom dates based on the the top of the last Wall cycle and the beginning of the current Wall cycle. 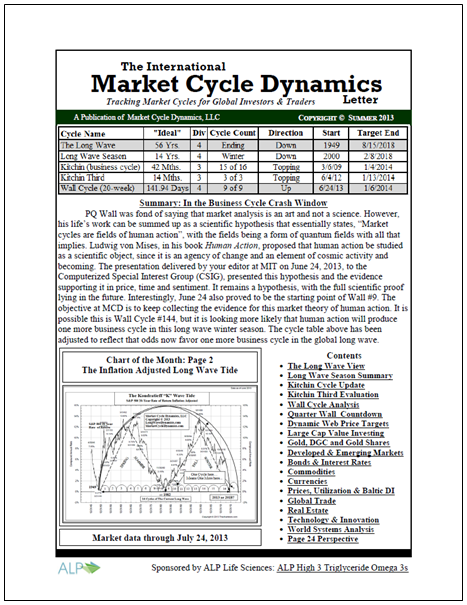 See the Current LWD Issue and the Weekly Update for current Wall cycle analysis.